A husband, a father, a brother, and most importantly, a proud advocate for African-American equality, Medgar Evers is a man whose life is still being honored and recognized today. Thursday, May 24, was no exception as local, state and federal officials gathered to pay additional homage to the slain civil rights leader. Family, friends, citizens of Jackson and public officials gathered on the front lawn of the Evers’ home located at 2332 Margaret Alexander Drive in Jackson to honor the late civil rights activist whose entire life focused on attaining justice for all. 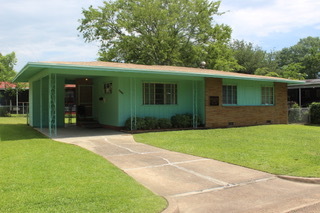 U.S. Rep. Bennie Thomspn, who represents Mississippi’s second congressional district, introduced the bill to congress with the desire to conserve the heritage of Evers’ home; its successful approval marked the first home of a civil rights leader to be characterized as a national landmark. The last honor occcured just a decade ago when the National Park Service designated the University of Mississippi’s Lyceum as a national monument, the site where James Meredith attempted to integrate a predominately whit institution in 1962. 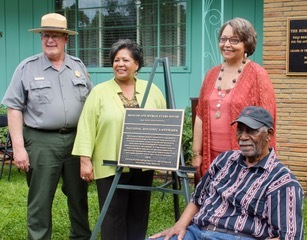 The bronze plaque was presented by Bill Justice, superintendent of Vicksburg National Military Park, to highlight the newly labeled landmark which housed the family of five and was the location of countless strategic meetings with public figures to combat racial inequality. Reena Evers-Everette, daughter of Medgar and Myrlie Evers, reflected on her father’s tragedy and expressed her gratitude about the preservation of the home and its new designation. “Almost 55 years ago, in this very location, on this driveway, on this road, a brutal accident changed the trajectory of my life and my family’s life, yet today with concerted efforts the trajectory has shifted once again to positive,” stated Evers-Everette. In 1954, Evers accepted the position to serve as the first state field secretary for Mississippi National Association for the Advancement of Colored People. As secretary, he organized boycotts, participated in marches and hosted voter registration events. Two years later, the Evers family moved into their ranch-styled home in Jackson’s first subdivision developed by African-American entrepreneurs. Evers’ push for voter equality eventually attracted enemies to his place of residence, resulting in a heartbreak that shook the black community. June 12, 1963, Evers was shot and killed in the front yard of his home leaving behind an unmatched legacy. Tougaloo College, owner and operator of the museum since 1993, will continue its operation under the National Park Service as a national designated site. Beverly Hogan, president of Tougaloo College, recognized the civil rights leader for his sacrifices and willingness to serve the community. “As I have learned more about the life and legacy of Medgar Evers, I believe he was called for a special purpose and all of us are better off because he lived,” expressed Hogan. Now that the home will function as a museum and a national historic designation, she promises to continue educating people about Evers’ life and the iconic movements he led. “[Tougaloo] will continue to work together to make sure that the community, not only in Mississippi but across this nation, will know about his great works that were started here in Mississippi and that impacted global democracy,” said Hogan. Hinds County Board of Supervisor Peggy Hobson Calhoun expressed her appreciation for the influential leader and is thrilled that Evers’ efforts are finally being awarded. “He made a difference increating a more peaceful world for individuals regardless of race…This historic landmark is indeed a testament to the great impact his work had upon the lives of the people around the nation and the world,” voiced Calhoun. Evers-Everette hopes the home will bring individuals closer to realizing the significant impact her father had not only on his family but also the world. “My hope is that the rich history that these collective partners have preserved and dedicated through the house will give visitors who come from local, international and state-wide, a true insight into a community of family and friends filled with love,” expressed Evers-Everette. She also encouraged Mississippians to use their voice to make all historical sites in the state a landmark of tribute to other leaders. Although Evers’ assassination signified the end of his earthly existence, it marked the beginning of a legacy that will now live forever.